Renal function impairment remains a common event in connection with anesthesia and surgery. Severe perioperative renal dysfunction (SCr > 6 mg/dL, CrCl ≤ 15 ml/min) accounts for one half of all patients requiring acute dialysis  and is associated with a mortality in excess of 50% . Mild to moderate renal function impairment is surprisingly common after surgery. In a group of 278 patients undergoing non-emergency general, vascular, or gynecological surgery, 65 of the patients developed an increase in serum creatinine levels ≥ 20% within the first six postoperative days . Thirty-two patients had increases that were sustained for more than 48 hours. For half of these patients, creatinine clearance had not returned to baseline levels by the time of discharge. 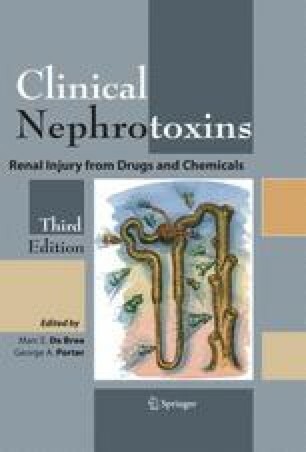 In most cases, the periope rative changes in renal function are not due to the anesthetic agent itself, although some volatile anesthetics have nephrotoxic potential due to direct toxicity of their metabolites. Instead, postoperative renal failure is more commonly multifactorial. Risk factors include: 1) preexisting renal or cardiac disease, 2) the type of surgical procedure, 3) occur rence of rhabdomyolysis or hemolysis, 4) adverse hemodynamic events, 5) inappropriate fluid management, and 6) concurrent administration of potentially nephrotoxic substances such as radiographic contrast agents, aminoglycoside antibiotics, and cyclosporine. Such risk factors usually play a more important role than the anesthetic agent in the development of postoperative renal dysfunction .